Thanks to Andy at Metal Blade for organising and Alan for his time. NOTE: Aoife conducted an interview with Alan at a later date on the same tour which can be read here. You’re currently on tour with Benighted, how’s it been going so far? It’s been really awesome. Benighted are super awesome to listen to every night and we’ve been having a lot of fun hanging out with them. We’re only day 5 into the tour so far but it’s been a lot of so far. The most recent album, Abysmal, came out around 4 months ago. What’s the fan response been like when you play these new songs live? I think it’s really good. We start out with the first track on the album for the show and as soon as the sample starts rolling people get super excited. A lot of the songs are super high energy, so I think it’s cool for them as it’s a relentless set. The more people that get injured, the more that they enjoy it I think! Was the production of the album any different to the previous album? Yeah definitely. We went for a way more natural sound with the drums and tried not to sample them. There might be a small blended sample on some of the drums but we tried to keep it natural and didn’t quantise everything. The kick sample got changed a little bit as on the last three it had the same sound but it sounds more aggressive and beefy on this album. I personally think it came out sounding awesome so I’m happy with that. Do you remember what kit you used for the album? 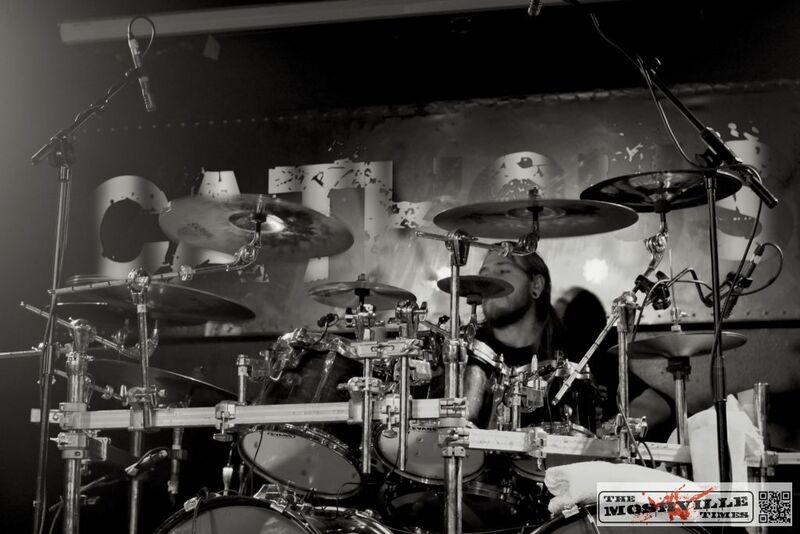 Yeah, I used Shannon Lucas’ old kit, which is a Tama Star Classic. I’ve been touring with it for the past 3 years and it sounds really good. We’ve not found the need to replace them yet but we might replace them soon. We did debate getting album wraps on all the drums but we’re not sure that Tama would be too happy with sending us a new kit every two years! Drummer question for you now, what foot technique do you use? I use the swivel technique [Floating Heel- James] as it still gives a lot of power if you play acoustically. Heel-toe is designed for use with triggers and although it’s good, it won’t work for playing acoustically. I played in Abigail Williams before I played in Black Dahlia Murder and that was a strictly no triggers situation. I had to use DW 9000 beaters on my Pearl demon drives just to get the volume for them. When we played a song from one of the earlier albums, it had a 240 run and I played it but I’m not sure how it sounded through front of house! What’s the wildest thing you’ve ever seen on tour? Are you going to be doing anything special for the 10th Anniversary of Miasma? I haven’t heard anything yet. Maybe there’s a possibility we might do some stuff but I’m not really sure if Ryan and Max know the parts. Maybe there might be something but as far as I know, I don’t think we’ll do anything. And finally, what advice would you give to a new band that is just starting out? Make sure that everyone is committed and motivated. It definitely takes every person giving 100% to get out there on tour and back it happen. Try and be as professional as possible with your gear and interactions with other people. Try and build good relations with other people as well as it will be very beneficial to have those contacts in the future.